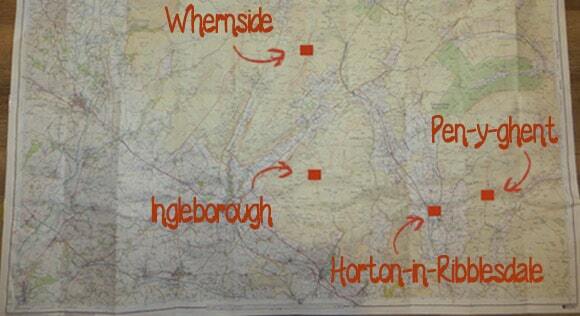 Discovery Walking Maps designed a map specifically for the Yorkshire Three Peaks Challenge. 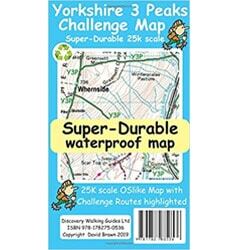 The map already has the Yorkshire Three Peaks route highlighted; the map is “zoomed in” and easier to see; and the material is durable and waterproof. If you are purchasing a map purely for the Yorkshire Three Peaks, the Discovery Walking Map is the recommended option. View the Discovery Walking Yorkshire Three Peaks Map on Amazon. Nothing beats a map. It won’t run out of battery or break on you for an unknown reason. There is also a feeling of satisfaction when navigating the “old fashioned” way: nothing but a piece of paper, a compass, landmarks in your surroundings and the confidence to read a map. 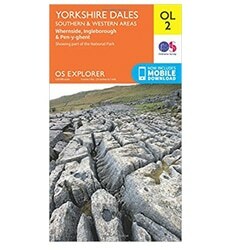 The Ordnance Survey (OS) Map you need for the Yorkshire Three Peaks is the OS OL2: Yorkshire Dales: Southern and Western Areas (OS Explorer Map). A compass is required to effectively navigate with the map. A waterproof, see-through case is recommended to protect your map from rain damage. The waterproof case can be attached to your backpack to reduce the time searching through your bag each time you need to check the map. OS Maps are huge. And double sided. 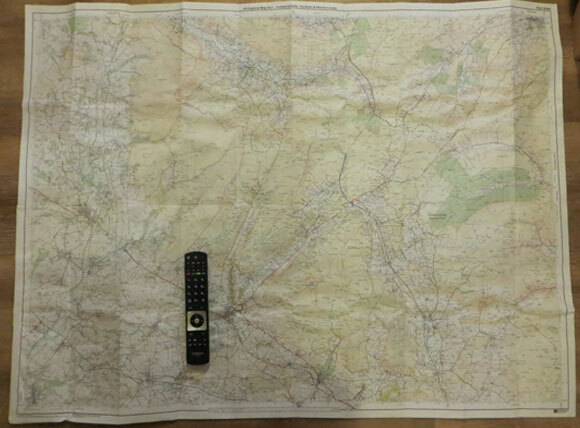 Once unfolded the map measures 127 cm x 95 cm, the image below demonstrates the size using a standard TV remote as a reference. Not the ideal item to unfold up a windy mountain. 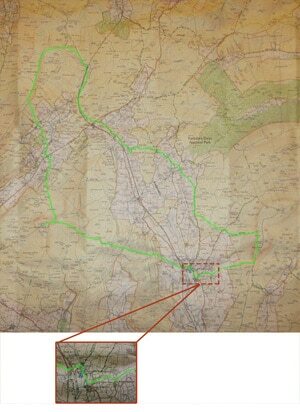 It is beneficial to draw the route on your map before setting off to complete the Yorkshire Three Peaks. Once the route is drawn on to the map, it can be strategically folded to the area of your walk to ensure you don’t need to unfold the whole map each time you need to check your location. Unfold your OS map on to the floor with plenty of space. To ensure the map is facing the correct way, look in the top right-hand corner for “West Sheet”. Using 6-figure grid references – the blue numbers on the x- and y-axis – you can locate Horton-in-Ribblesdale, Pen-y-ghent, Whernside and Ingleborough. If you are unsure how to use 6-figure grid references, the 2-minute video from the Ordnance Survey is a very easy-to-follow guide. They also have written instructions on their website. Mark each summit on the map. Each checkpoint is highlighted below to help you locate them faster. With the main checkpoints highlighted it will be easier to draw the route on your map. It is your decision on how to mark the route. You can use faint pencil that will rub off easily if you do not want to permanently mark the map or use a highlighter if you want a visible and clear route. The full route is highlighted in the below image. Click on the image to enlarge.